Formed in the latter part of 1968 the band grew from a four piece to a six piece to include a trumpet and sax. Full line up were Les Marshall (drums, percussion and vocals), who joined following a lengthy tour with Tim Rose. He replaced John Bonham as Tim’s drummer. Richard Pannell (lead guitar and vocals), Andy Abbott (bass guitar and vocals), Geoff Brown (rhythm guitar and lead vocals), Dave Caswell (trumpet, flugelhorne) and John Smith – Replaced by Lyle Jenkins (soprano, alto and tenor saxophones). 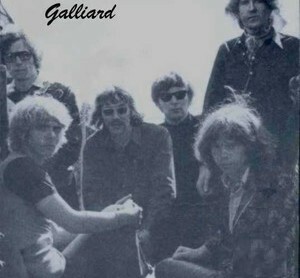 Following extensive rehearsals and tour dates, Galliard went on to record two albums produced by the now legendery Phil Wainman, and a sampler album. The first album, Strange Pleasure, (Deram) was much admired by the musical press and by the bands many admirers, however, failed to generate significant sales. The second album, New Dawn (Deram) also failed to impress the record buying public. Much was written in praise of their levels of musicianship, and influential people like John Peel said “I spent a couple of fine evenings with them, remembering some of the great records of the early fifties. Galliard have an LP for mid January release on the Deram-Nova label and it should be pretty good”. Does anyone remember a local brum band called Clearwater. They played regularly at The Cedar Club and Rebeccas, This would have been 1969 – 1972. I think the bass player was Ray Morgan. `if so `i was I was the first drummer with his previous band ‘The Candy Sripes’. Sreve Lewis on gtr & vox, Ray on bass & vox, Roger Havard on gtr & vox and Steve Evans on vocals. Thanks for prompting that memory, I often wonder what happened to Ray after ‘Clearwater’.